Mauao is an historic reserve. 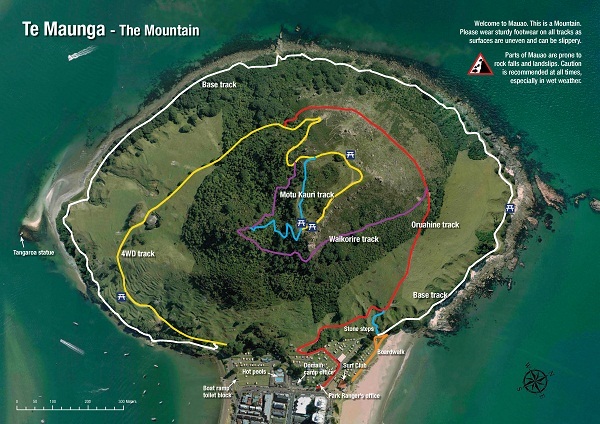 It is managed by the Tauranga City Council.The base track is 3.4 km and takes about 45 minutes to walk. It is suitable for strollers and wheelchairs but please take care. There are several tracks to the summit. The two tracks recommended for sightseers are the Oruahine and Waikorire. The summit is 232m high – it takes about 40 minutes to get to the top. There are no rubbish bins on Mauao. Please take all rubbish away with you. The base track is 3.4 km and takes about 45 minutes to walk. It is suitable for strollers but please take care. There are several tracks to the summit. 4WD track (Vehicles are not allowed except for maintenance and emergency purposes only). The summit is 232m high – it takes about 40 minutes to get to the top. On a hot day it can be hard work – pace yourself and take water, sunscreen and a hat. There are no rubbish bins on Mauao. Please take all rubbish away with you. Please leave all gates as you find them.The 4WD track starts at the end of Pilot Bay. You can use this track to walk to the summit. Both of these tracks start from the ocean side of the base track. Follow the boardwalk in front of the surf club to the start of the base track. The summit climb begins a few metres from the end of the boardwalk. The Oruahine track ends part way up the 4WD track. Turn left onto the 4WD track and continue to the summit, or turn off the 4WD track onto the Motu Kauri track, then turn left at the lookout intersection to go to the summit. The Waikorire track is a steep track. Turn right at the lookout intersection to go to the summit. Approximate distances taken from the signs at the base. The Oruahine track goes from the light house and meets up with the 4WD track ¾ of the way up the mountain. It is on the ocean side of Mauao. From the lighthouse to the summit on the town side of Mauao.